Lauded by Verdi, Debussy, and other music legends, the celebrated conductor Arturo Toscanini raised the standards of orchestral and operatic performance over an astonishing 69 years on the podium. But as he did so, he acquired a reputation as something of a tyrant who unleashed an explosive temper at musicians if rehearsals did not meet his expectations. 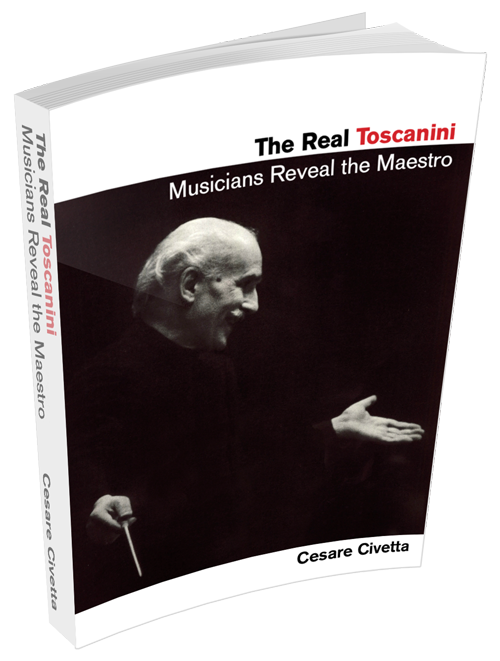 In The Real Toscanini: Musicians Reveal the Maestro (Amadeus Press), Cesare Civetta presents an intriguing collection of vivid interviews with 50 artists, including composers, conductors, singers, and instrumentalists who worked with Toscanini. These conversations, together with other firsthand recollections, clarify Toscanini’s philosophy, musical style, and techniques. Overall, The Real Toscanini depicts a man tormented by inner demons of anger and depression, which were easily triggered by his frustration at being unable to produce the musical ideal in his mind’s ear. He is also revealed as a vehement anti-Fascist and an unequivocal opponent of totalitarianism and racism—he defied Mussolini and publically opposed Hitler. The book includes a comprehensive account of his 1936 inauguration of what is now known as the Israel Philharmonic, in solidarity with Jewish refugee musicians. Toscanini comes through in this book as a tortured but deeply humane individual who strove to constantly improve—a sincere and humble musician who was nevertheless the pre-eminent maestro of the 20th century. "A riveting account of a life of a musical giant... Civetta offers a most thorough, poignant and inspirational piece, weaving a most intriguing story depicting the life of the legendary maestro." Civetta is the producer of The Toscanini Legacy radio series for which he interviewed fifty artists who worked with Toscanini. His book, The Real Toscanini: Musicians Reveal the Maestro is based on these interviews. Civetta lives in New York City, where he is the founder and conductor of the Beethoven Festival Orchestra. I salute Cesare Civetta for his passionate, meticulous and often downright revelatory research into the musical thought and work of Arturo Toscanini. This book will serve not only as an invaluable source for scholars but as a lively read for anybody who cares about music. I devoured this book and found it to be powerful, at times hilarious, enormously touching, and most of all - inspirational. The Real Toscanini is a fascinating look at one of the greatest conductors ever to grace a podium. Cesare Civetta crafts a story that captures The Maestro like no one has ever done before. In Maestro Civetta's amazing account of Arturo Toscanini at work, a vivid, absorbing portrait of a man is brought to life and with it a haunting glimpse of a time when music was a serious vocation, not a profession. He was a dedicated and scrupulous musician filled with love, respect, and imagination for the world of music and a deep, abiding love for the singers who helped him weave his magic in opera. A guardian of the composers' wishes, he elicited energy and detail from his musicians and inspired awe and gratitude in his public. Viva Toscanini, more alive in these pages than I have ever seen in any other source, and ultimately more deserving of the august privilege afforded him by some of the greatest musical minds of the twentieth century of being their favorite maestro. Bravo, Maestro Civetta, for casting this bright light on the life and principles of Arturo Toscanini—who is teaching and inspiring us still. © 2019 Cesare Civetta. All Rights Reserved.